PET PRIDE NO FLEA is a FOOD AND WATER SUPPLEMENT. PET PRIDE NO FLEA is without a doubt the finest and safest way for long term control of any blood sucking insects. Such as fleas, ticks, mesquitos, even biting flies! 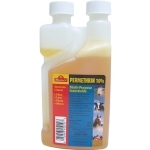 This product will work for dogs, puppies, cats, horses, goats, and even chickens. NO FLEA works through the blood stream causing your pets blood and skin to become offensive to insects but not humans. NO FLEA is an ALL NATURAL product. There are NO chemicals, NO preservatives, NO poison or artificial flavorings. It is a NON TOXIC product. NO FLEA contains beneficial herbs and essential citrus for good health. GARLIC is nutritious and conditions the skin and coat. APPLE CIDER VINEGAR kills infections, provides a healthy heart, great digestion and helps with sore muscles and arthritis. Protect your pet from annoying visitors with the Flys-Off Fly Repellent Ointment for Dogs & Horses. 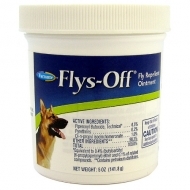 Because flies can be a big problems for dogs, especially in kennels or runs, this ointment works to keep flies away from open wounds, sores and other sensitive areas. It’s also great for the equine pals, working to repel those annoying flies in the stable too. This is great for healing, as it prevents your animal from constantly swatting away flies and allowing them to leave the wound or sore alone.